- Some exterior lights flash, all the doors, trunk, and fuel fill door lock, and the security system sets. - A beeper sounds and verifies the security system is set. - Some exterior lights flash twice, and the driver’s door and fuel fill door unlocks. - The remaining doors and the the trunk unlock. Open the door within 30 seconds. If you do not open a door within 30 seconds of unlocking the vehicle with the remote transmitter, the doors will automatically relock. If the interior light switch is in the door activated position, the interior lights come on when you press the unlock button. No doors opened: The lights fade out after 30 seconds. Doors relocked with the remote: The lights go off immediately. The remote transmitter uses low-power signals, so the operating range may vary depending on the surroundings. 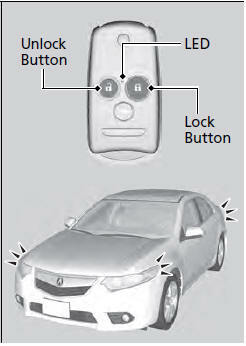 The remote transmitter will not work when the key is in the ignition switch. The remote will not lock the vehicle when a door is open. If the distance at which it works varies, the battery is probably low.